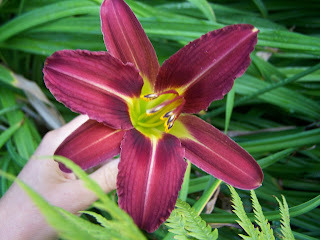 Most of my day lilies are this colour. I keep dividing them each year and spreading out the clumps so that I have them in several different spots. This year they seem to have come and mostly gone so quickly. 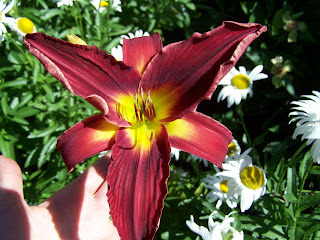 I have just one of this colour, it's a little different and a bit larger bloom than the other kind. 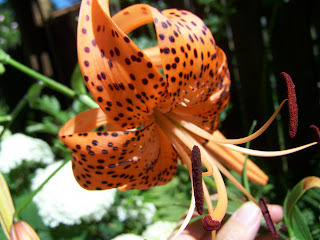 Yesterday I noticed that the tiger lily was blooming. I just love the way it looks, what a cool plant. 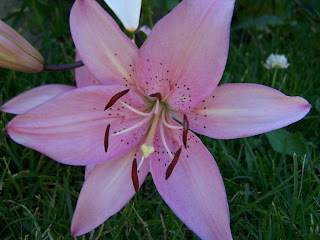 And this one was in bloom a few weeks ago right beside our back patio - so pretty. I love being surrounded by such loveliness and colour all through the Spring, Summer and Fall in the garden. My garden has many lessons to teach me about living in the moment and enjoying what is. Those are some important life lessons. Heather, that tiger lily is incredible! I have seen so many but none that look like that. Your garden is a constant source of beauty, thank you for sharing.